This is a big loss for Microsoft and a big win for Google. 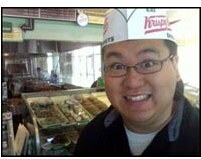 Kinect developer and infamous Wii hacker Johnny Chung Lee has left Microsoft to become a “Rapid Evaluator” at Google. In a post on his personal blog, Lee writes that he spent nearly three years working on human tracking algorithms for the Kinect, working on the gaming device from back when it was called “Project Natal” to its eventual release to the public (The Kinect sold 8 million units in the first 60 days it was open to the public). Lee, who worked within Microsoft’s Applied Sciences group, also received a PhD in Human-Computer Interaction from Carnegie Mellon University. While it’s unclear what Lee will be doing as a Rapid Evaluator at Google, this could be a big talent win for the search giant’s rumored Gaming portal.